Around 3,000 Swans fans are in the corner of the East and Sir Bobby Charlton Stands; the leg room between rows is tight, so fans tend to stand. The concourse looks cramped, but there are plenty of food and drink outlets so queues are never huge. Pies and other footy food is sold; as is Bulmers, Heineken, John Smiths and wine. At one end a large TV shows Sky. Manchester is one of the best places in the country for a weekend away. Printworks and Deansgate are great places to eat and drink, and whether gay or straight Canal Street is good. Pubs, clubs and restaurants are plentiful in these areas, and with Manchester being a major city there are loads of hotels to go around. Hotels near the city centre are Double Tree by Hilton (M1 3DG), City Centre Piccadilly Premier Inn (M1 2HR), Jurys Inn (M1 5LE), Mercure Piccadilly (M1 4PH), Novotel Manchester Centre (M1 4LX), The Palace Hotel (M60 7HA) and Hilton Manchester Deansgate (M3 4LQ). A great pub I’ve stayed at a few times is the Burton Arms Hotel (Swan Street, M4 5JZ). It’s in the middle of all the action, a stroll from Deansgate and train station. Tours of the stadium are available daily (except match days) and there are many types of tour available for museum only, tour and museum, legends tour or the full experience, family and group tickets offer a discount. 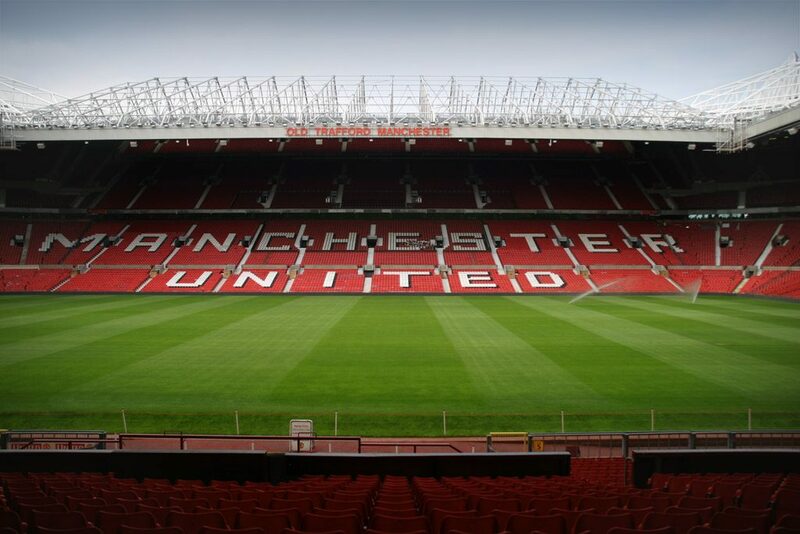 Book a Manchester United stadium tour online to get a discount. Remember The Crystal Maze? It costs from £30 and lasts 2 hours at the old Granada studios (M3 3JE). This is extremely popular and you must book in advance. The National Football Museum (M4 3BG) is in the middle of Manchester, next to Victoria Station. It’s massive, has free entry and has the world’s greatest football collection of over 140,000 items. There’s a Classic Bike Rally at Bury Transport Museum (BL9 0EY) over the weekend. Tickets are £3.50, £2 for children, £3 for concessions with family tickets at £9. A gin festival runs from 23rd March – 1st April at Victoria Baths (M13 0FE) tickets are £10. The three pubs nearest the ground, the re-opened The Trafford (M16 0RP) and The Bishops Blaize – a Wetherspoons (M32 0SF) won’t let you in with away colours. The best bet is the city centre or along one of the stops on the Metrolink. The Quadrant (M32 8GR) has a good mix of home and away fans and a chippy next door. There’s plenty of street parking in this area, up to about 2 hours before kick off. The pub is a 10 minute walk away from Old Trafford, in the direction of the cricket ground. The Lime Bar (M50 3AG) is in nearby Salford Quays. It has good beer, quick service and again a good mix of home and away fans. Away fans are OK to drink in The Bridge (M33 7QH) at Sale, its two stops and 8 minutes on the Metro from Old Trafford. The Matchstick Man (M50 3WL) is a Hungry Horse pub and has a big menu and allows away fans in. There are lots of small private car parks near to the ground, otherwise it is street parking. Old Trafford Cricket Ground (M16 0PX) charges £10. Get there 2 hours before KO, or it takes ages leaving the car park after the game. Park at Salford Quays Lowry Mall (M50 3AH), and you’ll find virtually no traffic on leaving, and the road takes you straight onto the M601 which joins up with the M62 & M6. This avoids the congestion of the traffic heading south. It costs £3.50 but you can get 4 hours free parking if you spend £5 or more in the shopping centre and get your parking ticket validated. There’s a multi-storey car park at MediaCityUK (M50 2EQ) at Salford Quays on the banks of Manchester’s ship canal, with Old Trafford a 10 minute walk. The car park is easily reached via J2 of the M602 with drivers avoiding the usual traffic queues. A three hour stay is £6. You can park in Altrincham town centre and take the Metrolink to the ground (20 minutes). Some pubs such as the Bricklayers Arms (WA14 1RF) in the town centre, will allow parking for the afternoon, as long as you buy a pre-match drink, they also do good food. You can get the Metrolink to Old Trafford from Ladywell Halt, in Eccles, with free secure parking. It’s a 15 minute journey on the tram and costs £1.20 return. It’s also only 200 yards away from the pubs in Eccles town centre. Trains leave Swansea for the 4.5 hour journey to Manchester Piccadilly leaving at 06:59, 07:44, 07:59, 08:54 and 09:54. Coming back, the 17:30, 18:30 and 19:30 get into Swansea at 22:20, 23:07 and 00:03. Its best by Metrolink/train from Manchester Piccadilly, as Old Trafford has its own railway station right outside the away end and a Metrolink station next to Lancashire Cricket Club. If using the Metrolink, away fans are better off taking the Altrincham – Bury route, getting off at Old Trafford station, by the cricket ground – just follow the crowds for the football. While the nearest stations to the ground are probably Pomona or Exchange Quays on the Eccles line, they’re not particularly convenient for getting to or from the away end. However, when leaving, if you have a train to catch after the game, avoid Old Trafford Metrolink at all costs. The best bet is to get a train from MUFC ground station to Piccadilly (Journey time 10 mins).